The term “periodontal”means “around the tooth.” Periodontal disease (also known as periodontitis and gum disease) is a common inflammatory condition which affects the supporting and surrounding soft tissues of the tooth; also the jawbone itself when in its advanced stages. Periodontal disease is most often preceded by gingivitis which is a bacterial infection of the gum tissue. A bacterial infection affects the gums when the toxins contained in plaque begin to irritate and inflame the gum tissues. Once this bacterial infection colonizes in the gum pockets between the teeth, it becomes much more difficult to remove and treat. Periodontal disease is a progressive condition that eventually leads to the destruction of the connective tissue and jawbone. If left untreated, it can lead to shifting teeth, loose teeth and eventually tooth loss along with substantial increases in you risk for diabetes, heart disease, stroke and other systemic diseases. 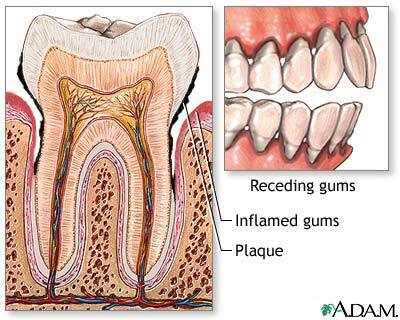 When left untreated, gingivitis (mild gum inflammation) can spread to below the gum line. When the gums become irritated by the toxins contained in plaque, a chronic inflammatory response causes the body to break down and destroy its own bone and soft tissue. There may be little or no symptoms as periodontal disease causes the teeth to separate from the infected gum tissue. Deepening pockets between the gums and teeth are indicative that soft tissue and bone is being destroyed. Early diagnosis is critical. Aggressive periodontitis – This form of gum disease can occur in an otherwise clinically healthy individual. It is characterized by rapid loss of gum attachment, rapid bone destruction and resistance to treatment. Necrotizing periodontitis – This form of periodontal disease most often occurs in individuals suffering from stress or systemic conditions such as HIV, immunosuppression and malnutrition. Necrosis (tissue death) occurs in the periodontal ligament, alveolar bone and gingival tissues. Periodontitis caused by systemic disease – This form of gum disease often begins at an early age. Medical condition such as diabetes are common cofactors. The first step in treating periodontal disease is a thorough diagnosis. Scaling and root planing – In order to preserve the health of the gum tissue, the bacteria and calculus (tartar) which initially caused the infection, must be removed. The gum pockets will be cleaned and treated with antibiotics or laser as necessary to help alleviate the infection. A prescription mouthwash may be incorporated into daily cleaning routines.